Dedicated to my darling Sophia! Klauthmonos Square is located off the central part of Stadiou street. Its name literally means "Lamentation Square" (from Κλαυθμών, Klafthmōn, weeping or lamentation) and the Ministry of the Labor is located by it. In the 19th century, Greek public employees had no permanent tenure, but could be hired or sacked on a minister's whim. Following each election, they would gather at this square in order to find out what the election results were: in case of victory of a party other than the one which hired them, they would lament their impending unemployment. 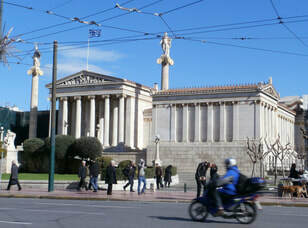 Along with the National Library, the National and Kapodistrian University of Athens and the Athens Academy, with which it is linked by Korai Street, it forms part of the re-planned Athens of the first part of the 19th century. The Athens' ancient fortification wall passed through the area now known as Klauthmonos Square in antiquity. 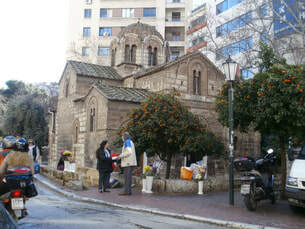 Outside and northeast of the wall, cemeteries were concentrated along modern-day Stadiou and Panepistimiou streets. During the construction of an underground parking area (1972-1974), part of the Themistoclean Fortification (478 B.C.) were uncovered to a length of about 65 meters, extending from Dragatsaniou to Papparigopoulou Street. This main wall was found in a fairly ruinous state. It rested on natural bedrock at a depth of 4.5 meters below today's ground level, and was 4.50 meters thick. At one point where it bends, it was reinforced by a tower (4.80 x 8.50 meters). Running parallel to the main wall, and at a distance of 6.5 meters from it, is the so-called Proteichisma (outer wall), which was added in the 4th c. BC and was the first line of defense. This wall 1.5 m. thick, rested at a depth of 5.5 to 8 meters, and is preserved to a maximum height of 7-8 courses. Part of the fortification moat, a long defensive ditch of 10 meters wide by 11 meters deep, was found in front of the Proteichisma. Following excavation, part was left visible in the underground parking area, while other parts were disassembled, transferred, and reinstalled at the level of the square. Other parts can be seen at 6-8 Dragatsaníou Street (on the northwest side of the square). Excavations brought to light building remains of various dates ranging from the late Classical to the late Roman period. A retaining wall composed of limestone blocks cut in an irregular, polygonal masonry pattern is dated to the late Classical period. The wall which traverses the plot in an East-West direction is approx. 30 meters long, founded at a depth of 5.10 below street level. It formed the South retaining wall of an ancient road, remains of which survive just North of the wall. The road's width, approx. 5.50 meters, is typical of large road arteries that lead to the city's gates or to major sites. ​Four waterducts of various dates and construction techniques were also unearthed, laying either on top or along the road;s surface. Three rectangular spaces are partly preserved at the south part of the road, which are thought to be contemporary to the above mentioned retaining wall. In addition, the architectural remains of five rooms, founded on bedrock, are dated to the Roman period. In their interior, parts of mosaic floors survive, made either of clay or marble tesserae inserted into mortar or of simple pebbles. Among the rooms, seven wells were brought to light. 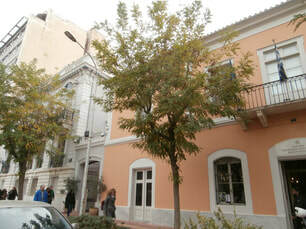 In the vicinity of Klauthmnonos Square, we recommend 5inAthens. 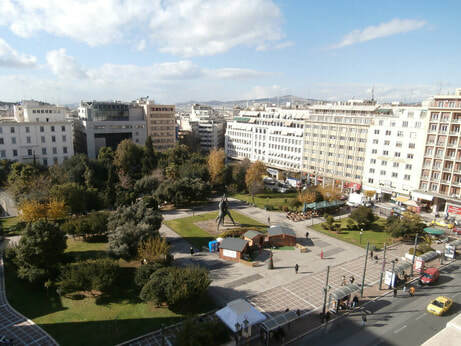 Ideally located close to major touristic attractions and vivid areas of the city, 5inAthens offers comfortable apartments in the heart of Athens. Each apartment is fitted with modern amenities and offers free WiFi. Apartments at 5inAthens offer a fully equipped kitchen stocked with an oven. Some units also feature an outdoor dining area. Each includes a seating area fitted with a satellite, flat-screen TV. Each apartment enjoys city views from its furnished balcony or terrace. The lively area of Monastiraki, boasting an array of taverns, bars and shops, is located within just 800 m away while the Acropolis is at approx. 1.5 km. The Museum of the City of Athens. The Museum of the City of Athens built in 1834 and restored to its original form by the architect Yannis Travlos, using the original plans of architects Lüders and Hoffer. In addition to many mementos and pictures of King Othon's time (1815-67), who reigned 1833-62, the museum contains a model of Athens in 1842, various views of the city and some architectural drawings complete the collection.